So far, things are going pretty quick and smooth on Project Get Shorty. The frame is down to its rightful length, and the Air Ride Technologies suspension, sans electric work, is installed. It only seems logical to keep things moving in the forward direction. Without missing a beat, the next step is to finish up at each corner. 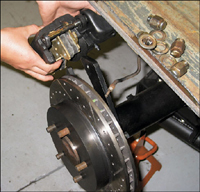 Now sure, the suspension has been brought up to par, but the truck is still missing one key component-brakes. Granted, the truck did come stock with discs up front and drums out back, which really aren't too shabby, but in the roundabout world of Los Angeles, I think I'd rather bet on four-wheel discs to keep my truck from looking like Stromboli's accordion. On top of that, by the time I rebuilt the factory brakes, I'd still be looking at a solid chunk of man-hours and a stack of cash. On the other hand, I could install four-wheel discs, which will take about the same amount of time, won't cost a whole heck of a lot more, and will be a much better setup. Therefore, I might as well ante up and bring Shorty to the level of modern-day vehicles. In the world of Chevy trucks, there are more aftermarket companies than there are options at a Vegas buffet. 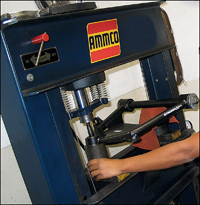 One company you are sure to stumble across when looking for aftermarket performance parts and accessories is Classic Performance Products (CPP) in Fullerton, California. One could say CPP is a one-stop shop when it comes to rebuilding a classic Chevy truck, which made them the perfect candidate for this install. 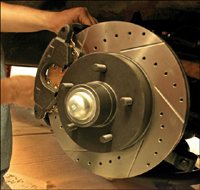 The key to stopping, the Classic Performance Products four-wheel disc deluxe brake kit. I decided to start the install at the truck's rear. 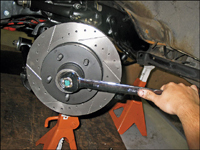 The new CPP rear disc brake kit comes with its own mounting brackets for the calipers, therefore the factory drum backing plates need to be removed. 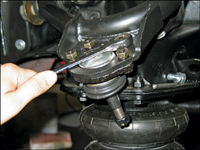 In order to do this, the axles must be pulled from the rearend by removing the C-clips in the rearend. With the backing plates removed, I then took a wire brush and cleaned up the area. 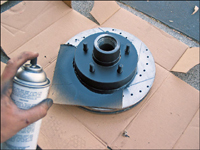 Once clean, I rattle-canned the flanges black to match the rest of the rearend. Before I installed the brakes, I decided to spruce things up a bit. Using a can of hi-temp semi-gloss black spray paint and a quickie cardboard stencil, I cut out the shape of the rotor hat and painted the rotor hats and calipers. The new look of the rotors gives off a hi-tech road race feel, which is way cool. 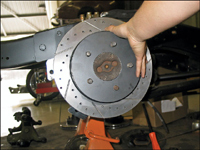 The next step was to bolt up the CPP caliper bracket to the rearend flange. 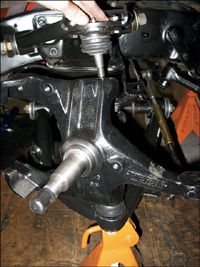 With the brackets on, I could then slide the axles back into place and reassemble the rear differential. Next up, I slid the new cross-drilled and slotted rotor on the axle. 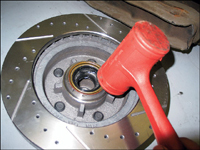 CPP makes things easy when bolting up the calipers to the bracket due to the fact that only two bolts are used. Once the calipers are bolted up, I could then install the new CPP e-brake cables to the calipers. 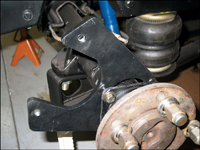 Up front, the Air Ride Technologies control arms were already installed. However, the ART arms utilize the old-style ball joints, so I had to take them off and head down to have the new ball joints pressed in. 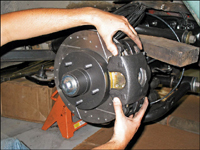 Next we pressed the new CPP ball joints into the arms. Once back at the tech center, I reinstalled the arms and dropped the new CPP drop spindle into place, which was also spray painted black for a clean look. Before the front rotors can be installed, I had to grease the new bearings and install them using the new seals as well. 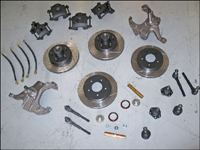 CPP gives you all the necessary hardware to mount the new front rotors, so it was a breeze mounting everything up. 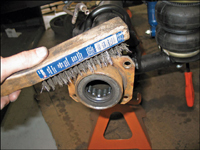 The new calipers bolt directly to the spindles instead of using a separate mounting plate. My next step was to bolt the calipers to the spindles. 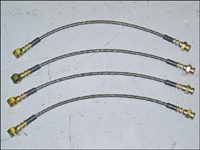 Instead of using rubber flex hoses, we are going to use these sick-looking stainless hoses that will also add some performance to the system. 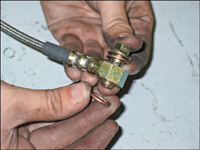 When bolting the stainless hoses to the calipers, be sure to use the provided copper washers for a secure fit. 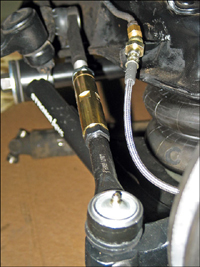 The deluxe kit comes with an entire tie rod setup. 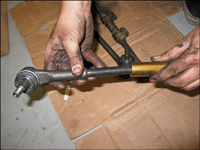 Using the appropriate jamb nuts, the tie rod ends were screwed into the CPP adjusting sleeves. 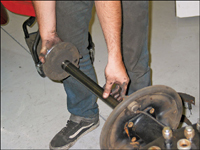 The new CPP tie rods were assembled to the length of the stock tie rods; that way the front end will track as straight as possible until we can get to the alignment center. 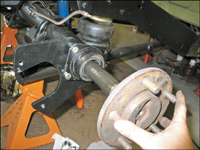 Then I installed the tie rod to the spindle and center link. 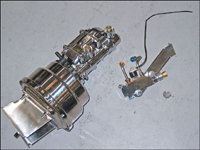 Dig the new dual master cylinder, dual-diaphragm 8-inch booster, and proportioning valve. Instead of going with a zinc-plated setup, CPP hooked us up with a chromed master cylinder, polished stainless booster, and polished proportioning valve. 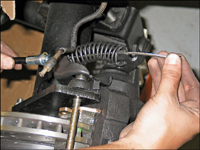 Before I installed the setup on the firewall, I had to determine the proper length for the power booster push rod, which attaches to the brake pedal. Once I determined the correct length, I tightened the jamb nuts. The last step for now was to install the setup on the firewall.